I keep forgetting just how beautiful NZ is, especially the south island. The terrain is quite different to that of the north - it’s mountainous, wild and rugged - and the lakes; so still and clear. Seriously, if you point your camera anywhere and shoot you will get a perfect scenery shot. Queenstown is a fantastic place to visit, as evidenced by the number of tourists passing through this area on any given day. On Friday morning after we picked up our rental vehicle we took a drive up to Coronet Peak looking for some snow. Yeah, no. There is no snow at this time of year, although you can see some on the higher mountain peaks. It was a bit of a hazy day, but there was a slight breeze, and that was good enough for the paragliders to take off. It all happens so quickly. We saw them set up, and within 10-15 minutes they had taken off and all was quiet. We then went for a drive to Arrowtown, but then Kien fell asleep so we did a ticky tour back to Queenstown. We stopped at some nice spots, and we did a bit of off-roading as well. We drove out heading toward Sunshine Bay. We ended up stopping at Wilson Bay. It was such a beautiful spot; a perfect place to skim stones and wade in the freezing water. 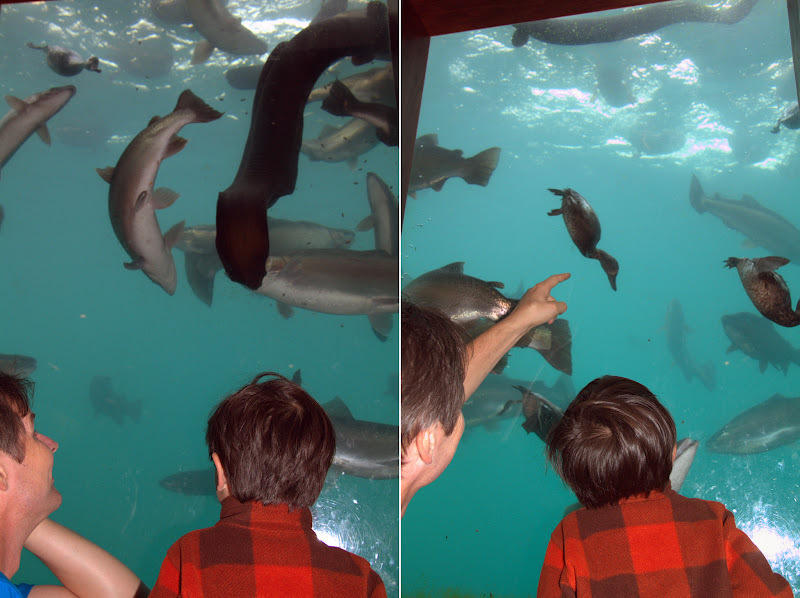 We came back to Queenstown township and went down to the underwater observatory. It was interesting to see the creatures lurking right under the pier not so far from shore, and although I thought it was a bit pricey we all enjoyed the experience. Kien loved feeding the fish from the dispensing machine and seeing the scaups dive deep to get the food. The salmon and trout were massive - I was wishing they were on my stove top being cooked for our dinner. That was day two sorted.